We get a lot of questions about what tools people should own and they only seem to pick up steam as we approach Father’s Day (are us dads really that predictable? Never mind, don’t answer that). “Should” is a strong term because what you need is very personal to the types of projects that you take on and how much budget/space you’re willing/able to dedicate to your tools. Also, I should note that Sherry uses every single tool that I do, so they also can make good Mother’s Day gifts… assuming your lady didn’t ask you for breakfast in bed and you got her a router. That might go over about as well as a vacuum cleaner or a toaster. Anyway, back to the much-asked-about tool rundown. Rather than completely dodging the “can you share a big list of all of your favorite tools in one place” question, here’s what I’ve done. 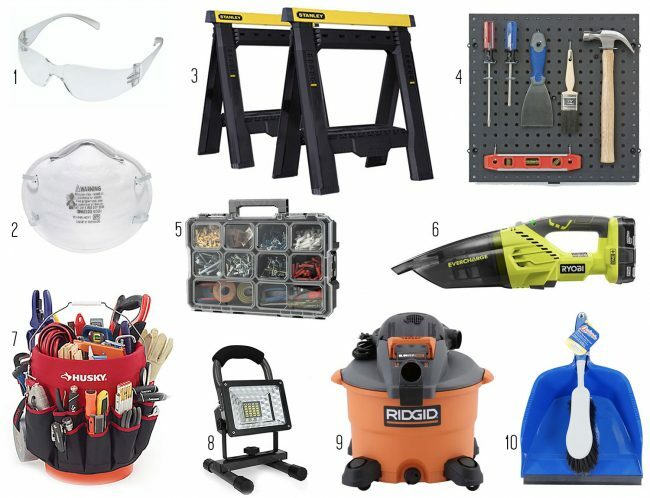 I looked through everything that I’ve accumulated over the years and picked out what I think are great basic tools and tool-related supplies to consider having. Some are completely unsurprising (hammer, duh) but others are easy to overlook items that come in handy a lot more than you’d think. So whether you’re just starting your collection or you’re looking to fill a gap in your (or your favorite dad’s) tool arsenal, here it goes. They’re meant to cover your bases for basic home maintenance and building projects. I have NOT included tools for specific projects like painting, tiling, drywalling, etc. I figured that might start to get overwhelming and 45 already seemed like a lot. 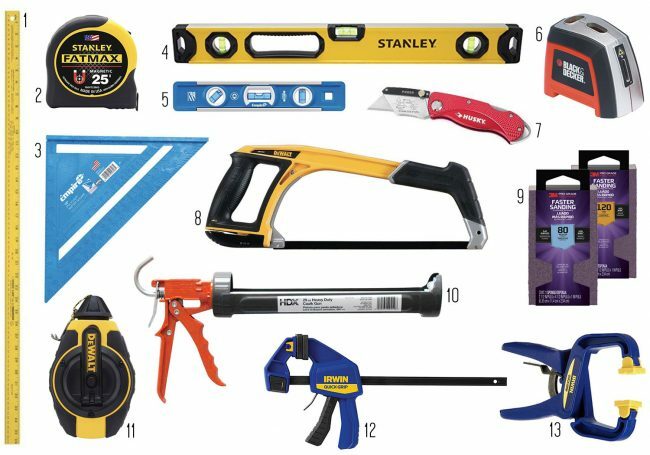 I’m sure I’ve probably forgotten something (and you may have other opinions about what constitutes a “must have” tool) but, again, I didn’t want this list to get too overwhelming. I can definitely come back with a tool breakdown for specific projects like tiling or drywalling another time if you guys think that would be helpful. Speaking of which, keep in mind that we accumulated these tools over several years. Please don’t interpret this as a shopping list that should be immediately added to your Amazon cart. Buying tools as you need them is one of the best ways to go. It’ll will ensure that you’re getting the item that best fits your current need – and you may be able to afford nicer items if you spread out your purchases over months and years. 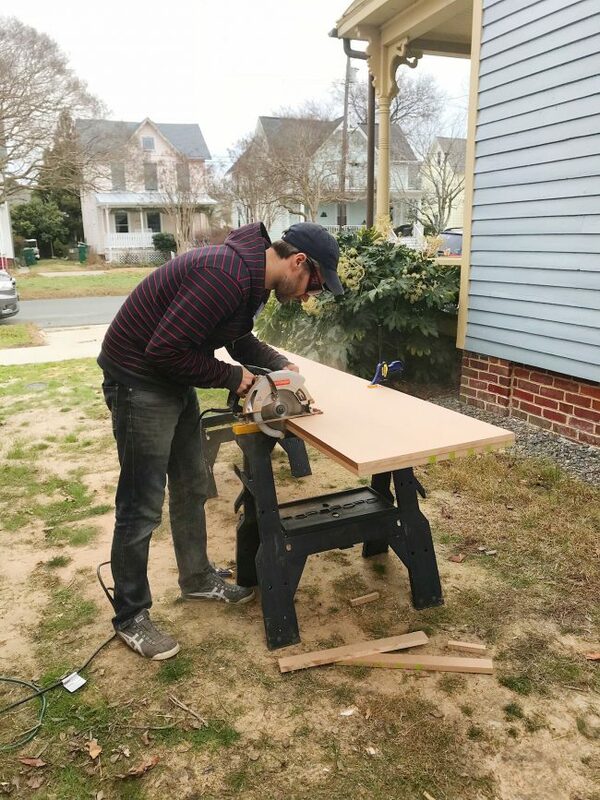 I was once very intimidated by power tools – especially saws – but now I love having the right ones on hand to tackle tons of projects with more speed and accuracy than I could accomplish by hand. Power Drill/Driver: From building furniture to hanging heavy stuff on the wall, this is my MOST USED tool. Don’t forget a battery and charger if you don’t already have one. Drill/Driver Set: I’ve liked having several screw heads and drill bits all in one small kit, including masonry bits! Hammer Drill: A corded drill is helpful for projects that need a bit more oomph, and making it a hammer drill helps if you ever need to drill into brick, stone, or concrete. Nail Gun: This battery-powered nail gun is so ridiculously easy and convenient for building projects or adding trim. Miter Saw: This is the closest to my hand-me-down saw, but it boasts a helpful sliding feature for cutting wider boards. This is my MOST USED SAW. Table Saw: This current version of my table saw is great for ripping boards (like flooring) if you need them narrower. Circular Saw: Great for cutting large materials like plywood. I’ve been using mine like crazy at the beach house. Only wish it were cordless like this one. Dremel Multimax: I don’t use this super often, but it’s great for small jobs in tight spaces – especially with the blade that cuts metal. Jig Saw: This comes in handy when cutting holes in the middle of materials, or when you aren’t cutting a straight line. Palm Sander: A power sander can make quick work of removing finishes or roughing up surfaces for painting. I personally like ones with a pointed tip for getting into corners. Let’s move on to the easy (and affordable!) hand tools. 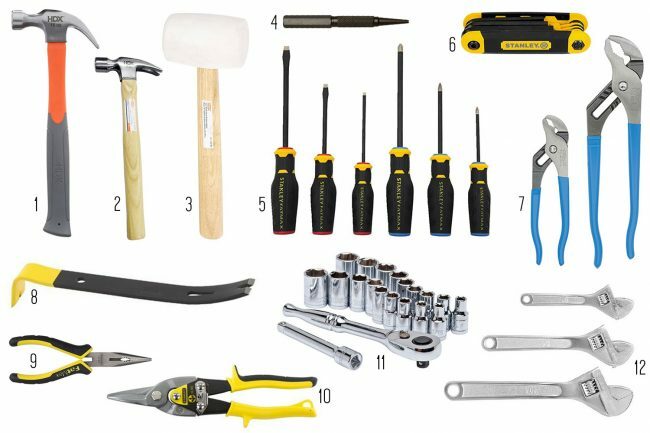 These are the types of tools you could also purchase as a kit if you’re starting from scratch (this looks like a good one) but I’ve included a few extra items (like #4 and #8) that I use more than you’d expect. Large Hammer: This one does the job, it’s only $7, and the orange handle makes it easy to spot. Small Hammer: We keep a lightweight hammer in a kitchen drawer for quick tasks, like hanging picture frames. Rubber Mallet: When tapping a tight board into place, this mallet’s white head won’t scuff (or leave a dent). Nail Punch: This is handy for setting nail heads flush into trim or building projects. Screwdriver Set: Call me old-fashioned, but I like having a small set of these handy in my shed and in the kitchen. Hex Key Set: This way you don’t have to keep every Allen wrench that comes with your IKEA furniture. Channellock Pliers: I find these V-groove pliers offer a tighter grip than the flat Channellocks. Pry Bar: Super handy for pulling off trim or removing really tough nails. Needlenose Pliers: This is another tool we keep handy in the kitchen for grabbing or prying small objects. Metal Snips: These cut thin metal and are great for work with ducting (they cut floral wire & picture wire too). Ratchet & Socket Set: These can make fast work of removing or tightening bolts. Adjustable Wrenches: A set of small lightweight wrenches is a nice complement to Channellocks, especially in tight spaces. These types of tools get less glory than the ones that do the smashing and screwing, but I find many of these to be the true lifesavers of our projects (I’ve proclaimed my love for #12 on our podcast more than once). Metal Yardstick: Good for measuring, but also to use as a straight edge when marking. Tape Measure: I’ve always found this tape measure to be comfortable and easy to use. You may also want a smaller version in the car for measuring furniture or other items on the go. Rafter Square: Great for keeping things square when building, or marking 45-degree angle cuts. 24″ Level: You may need something longer, but this easy-to-grip level does the job fine for most tasks. 9″ Level: A smaller magnetic level like this is great for tight spaces and household tasks like leveling art. Laser Level: This simple laser level has helped us hang picture collages & curtain rods for over a decade. Utility Knife: A handy knife like this is good for lots of tasks, including cutting drywall. 5-in-1 Saw: I own quite the mish-mash of hand saws, so this 5-in-1 would be my pick if I were starting over. Sanding Blocks: We keep a variety around to smooth rough cuts or rough up surfaces we’re painting. Caulk Gun: This pretty basic caulk gun is our go-to for any, well, caulking. Chalk Line: Use this to mark straight lines on objects (like plywood) or on floors too large for a straight edge. Trigger Clamps: These are my favorite clamps to hold materials in place while working on them. Handi-Clamps: It’s also good to have these smaller and quicker clamps handy too. Last but not least, I wanted to include some other supplies you’d probably appreciate having around – especially if you have a workshop, shed, or dedicated spot in your garage for all of your tools. Safety Goggles: We keep a pair (or 2!) around to protect our peepers when using power tools. Dust Masks: Some jobs may require something heavier duty, but these are great for most tasks. Saw Horses: These lightweight collapsible saw horses can prop up wood while you cut it – or create a mobile workspace. 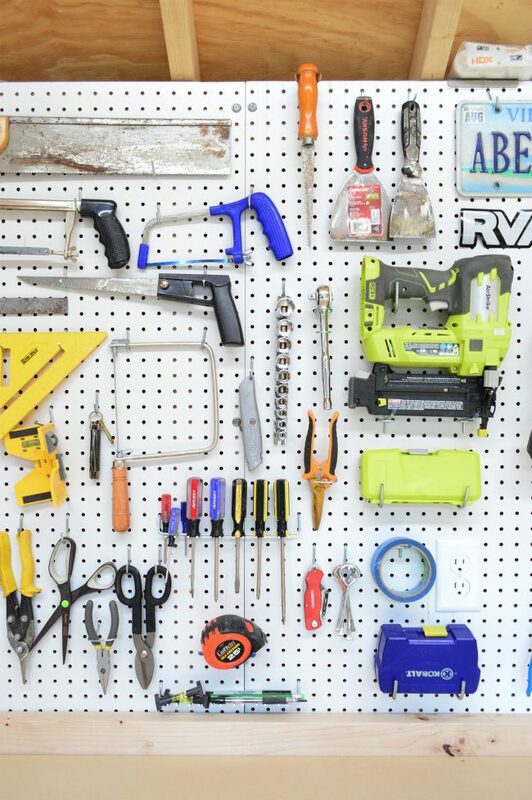 Pegboard: Some sort of wall organizer is a HUGE help, some (like this larger one) come with bins too. Small Parts Organizers: A good system to organize your screws, nails, etc is key. This one’s nice because it’s portable. Hand Vacuum: This is on my wish list since I want an easy / fast way to tidy up my workspace. Portable Tool Organizer: When I use a tool bag stuff gets lost on the bottom, so I’d love to switch to one of these bucket jockeys. Work Lights: It never hurts to have additional light sources. Here’s another versatile option. Wet/Dry Vac: A bigger vacuum like this one’s great for big demo or clean up projects, as well as day-to-day workspace cleaning. Dust Pan Set: Can you tell I’m big on cleaning? Don’t forget this old-school standby. 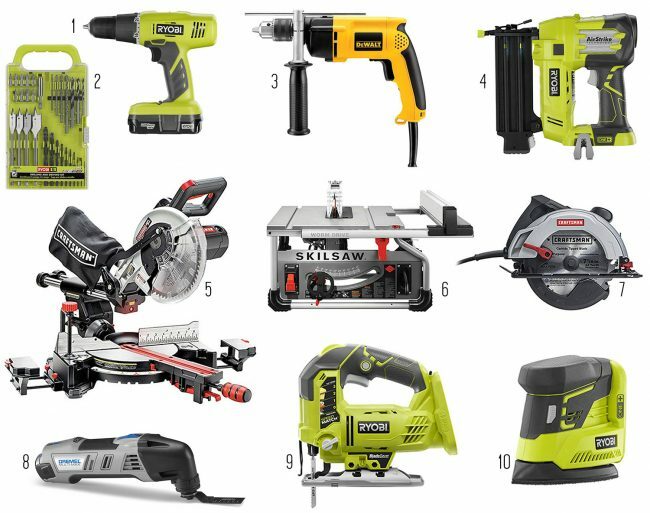 If you want to read more about tools, check out this post we did called 5 Power Tools That Changed How We DIY (it includes a couple not on this list!) and this post about how we organized our shed.